Sabine Byrne took a radiation treatment and the oath to become a United States citizen Monday morning at Southeast Health Cancer Center. It marks the first time the Cancer Center has been designated as an immigration swearing in site, which is typically administered in Montgomery. 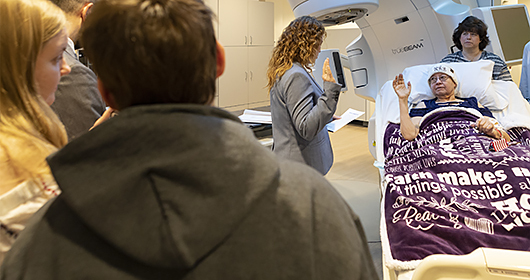 However, Jarrod Adkison, MD, radiation oncologist, and the staff of the Cancer Center wanted Sabine to see her dream to fruition, despite her inability to travel. That dream became a reality Monday thanks to U.S. Rep. Martha Roby and her staff facilitating a plan for U.S. Citizenship and Immigration Services (USCIS) to make a road trip to Dothan to administer the oath in the radiation treatment room. Sabine, a Northview High School special education teaching assistant, was diagnosed with cancer and had to undergo her first emergent radiation treatment on Friday, January 18. It was the same day she was supposed to be in Montgomery for her final interview and take the citizenship oath. Not wanting her to lose her opportunity to become a citizen, Sabine said Dr. Adkison put his foot down. He initiated the contact with Roby’s office. She completed the interview part of the process on Friday, January 25 at Southeast Health, which cleared the way for the ceremony on Monday. With her hope blanket to beat cancer draped over her, Sabine repeated the oath while lying in a hospital bed. She fought back tears as Teri Villarreal, senior immigration officer with USCIS, led her in the oath of allegiance to the U.S. Her son Shawn, 33, and her daughter Victoria, 22, stood proudly by as their mother joined them as U.S. citizens. Also in attendance for Monday’s ceremony were Albert Smith, USCIS, and Barbara Light from Martha Roby’s office. Sabine became a citizen almost 33 years to the day she came to this country on February 1, 1986. At the time she was married to a U.S. serviceman and they moved to Ozark. She began the process to become a citizen about a year ago and receive word during Christmas that she would be interviewed and receive the oath in January. Cancer has taken a great deal from Sabine. Thanks to Martha Roby, USCIS, and the Radiation Oncology team at Southeast Health Cancer Center, it could not take away her becoming a proud U.S. citizen.